This new and innovative product enables two HDMI compatible display units to share a single HDMI A/V source, while providing analog (RCA L/R) stereo audio and optical audio outputs. The integrated DAC supports incoming digital stereo audio format upto 24bit/192kHz. The optical audio output supports incoming HDMI audio format up to Dolby Digital 5.1CH / AC3 and DTS 5.1CH. It does not support more advanced audio formats, such as PCM 5.1CH, HD audio and beyond. Those advanced audio formats are still available from the HMDI output, because HDMI output signal is identical to the HDMI input signal. 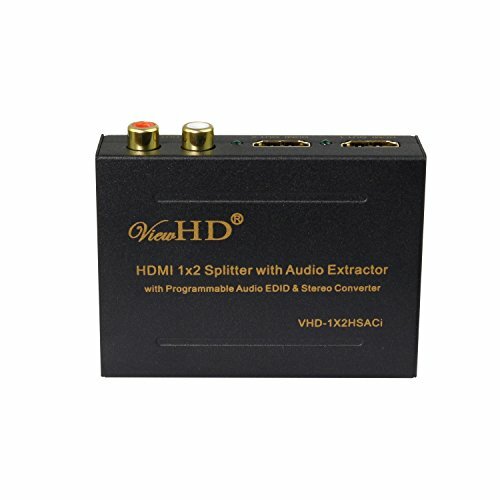 The optical / Toslink output does support Dolby D+ format, please make sure the AV receiver can support DD+, and if you ever encounter a problem with DD+ extraction, please first set the HDMI source output to Dolby Digital, make sure your system works, then switch the audio format from Dolby Digital Plus. If this still doesn't fix the problem, please upgrade the Toslink cable ( we recommend B004CARB9W ). If you have any questions about this product by ViewHD, contact us by completing and submitting the form below. If you are looking for a specif part number, please include it with your message.